So you fancy a trip to Rome. From the UK it is very easy with a variety of airports linked to the “Eternal City”. Once you have arrived it is a simple journey by train (from Fiumicino – officially named Leonardo da Vinci Airport) and by bus from the alternative Ciampino. Visitors by cruise ship arriving in Civitavecchia should also take the train and all the lines lead to Termini in the heart of the city. There are just too many hotels to choose from in Rome, from the super luxury to very modest clean lodgings in elderly apartment blocks, each floor managed as a simple accommodation unit with a number of self-contained rooms. Even these are not cheap (€60 upwards) which confirms that Rome, for the tourist, is one of the world’s most expensive cities. Plan at least three nights in Rome. Even a full week is not enough. But try and keep away from the key summer months of June, July and August. It will be very hot. Rome vies with Paris as the world’s busiest tourist city. Opinion can be divided but it has a lot more to offer in may ways than the French capital. However long you are in Rome our recommendation is to take one of the open deck tour buses. There are several routes and itineraries to chose from and each offers a 24-hour pass and you can get on and off as much as you like. Commentaries are available in all the major languages. The 48-hour pass also includes the riverboat network too and is good value for money. Other alternatives are to hire a Segway electric bike/scooter (and they are not difficult to master) and Rome offers some very good walking tours (including the loan of a headset) which is another way of learning about the city. Rome is in fact two cities. Rome itself, the essential parts on one side of the Tiber, and the other The Vatican, the smallest country in the world, across a choice of bridges, historical in themselves, from Roman Rome. 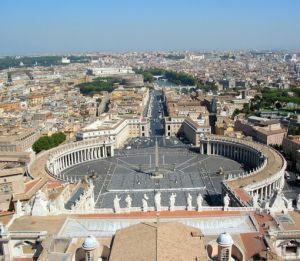 Granted independence in 1929 by Mussolini, Vatican City covers less than 110 acres and has a population of just over 800. The present Pope Benedict XVI, formerly Joseph Alois Ratzinger, was elected in 2005. Tradition holds that the obelisk in the centre of the Vatican circus was the site of the crucifixion of St Peter. What is certain is that St Peter's Basilica has the largest interior of any Christian church in the world, holding 20,000 people. There has been a church on this site since the 4th century. Construction of the present basilica, over the old Constantinian one, began in1506 and it was completed in 1626. Entrance to the basilica is free and the building is open from seven in the morning until seven in the evening during the summer months. The dress code is very strict with no bare shoulders for women or shorts for men. Michelangelo’s masterpiece, La Pietà, is in its own chapel to the right as you enter. There is a lift to the viewing gallery in the dome itself. Michelangelo is credited with the greatest church in Christendom but he in fact, late in life, was more of a superintendent superbly managing the work of others. Under the building are the grottos, the last resting place of many Popes including the only English holder of that most significant of posts, Adrian, born in Bedmond, Hertfordshire in 1100 (died Rome 1159). With the Vatican Museum and gardens you pay for the mind boggling experience. 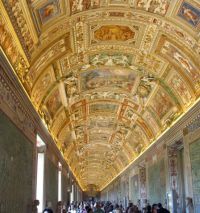 The final gallery, or salas, is the ‘Pièce de résistance’ the Sistine Chapel. There are works by Leonardo da Vinci, Raphael and Titian; plus many, many others. Rome requires a book, or several books to justify it, not just a 1,500 word review. 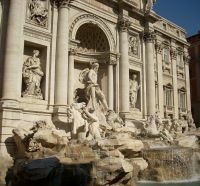 Amongst the suggestions for a visit one should include the Arch of Titus, Area Sacra dell'Argentina, the Aurelian Wall, the Baths of Caracalla, the Capitoline Museums, Hadrian's Villa, the Spanish Steps, the Trevi Fountain and Tiber Island. But others may have different route itineraries. AERBT managed a view of three outstanding sites two from Roman times and another just 100 years old. If your time in Rome is limited the Coliseum and Forum is a must. The forerunner of Wembley, or any other sports stadium, the Coliseum was said to have been funded from the spoils of the capture of Jerusalem. It was completed under the Emperor Titus in 80 AD and sat 50,000. What is true is that the Coliseum hosted gladiator flights to the death, and spectacular shows, but it was certainly not the site of Christians being thrown to the Lions. 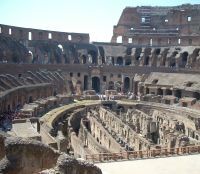 The collapse of the Roman Empire also meant the end of the Coliseum as a theatre (or circus) and by 600 AD its days as a stadia were ended. View the Arch of Constantine and then proceed to the Forum, the centre of political, administrative and commercial life during Roman times. There is too much to describe here. Much of the area is still very much an archaeological dig. 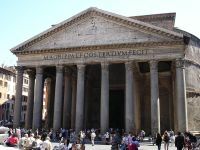 The Pantheon was built in the 2nd century AD. Even today it is the world's largest unreinforced concrete dome. It is one of the best preserved of all Roman buildings and has been in continuous use throughout its history. Since the 7th century it has been a Roman Catholic church. You can get married in the building. 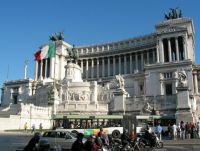 Buried within the building are the painter Raphael and Kings of Italy Vittorio Emanuele II and Umberto I. There are no words to describe the interior. Just stand and gape at the ceiling by Giovanni Paolo Pannini. The building is one of the most copied around the world, from its namesake in Paris, the Jefferson Memorial, and the Manchester Central Library in the aptly named St Peter’s Square. The Victor Emmanuel II Memorial, completed in 1911 serves not only as a fine military museum but by taking the lift the top offers perhaps the best view of Rome, certainly of The Forum and Coliseum. It is a strange place to find a café. Sit down, take it all in, and remember that Rome has been the centre of civilisation for 2,000 years. It is worth noting that for many of the official tourist sites EU citizens over 65 are granted free admission and the same goes for those under 18. However you MUST have your passport with you and since Vatican City is not technically part of the EU for the museum, gardens and other highlights there is a fee to pay.